This is a simple way to put together a quick and healthy lunch to take to work or school. Add a drink, and you have everything you need for a filling lunch. Some members of our household like to have their hummus and veggies with pretzels or pretzel chips, so we have some bags of those on hand, too. It makes packing lunch on those busy weekday mornings a breeze. I got the idea for this make ahead lunch from this video for “Masonables” on YouTube. In fact, I fell in love with this concept. 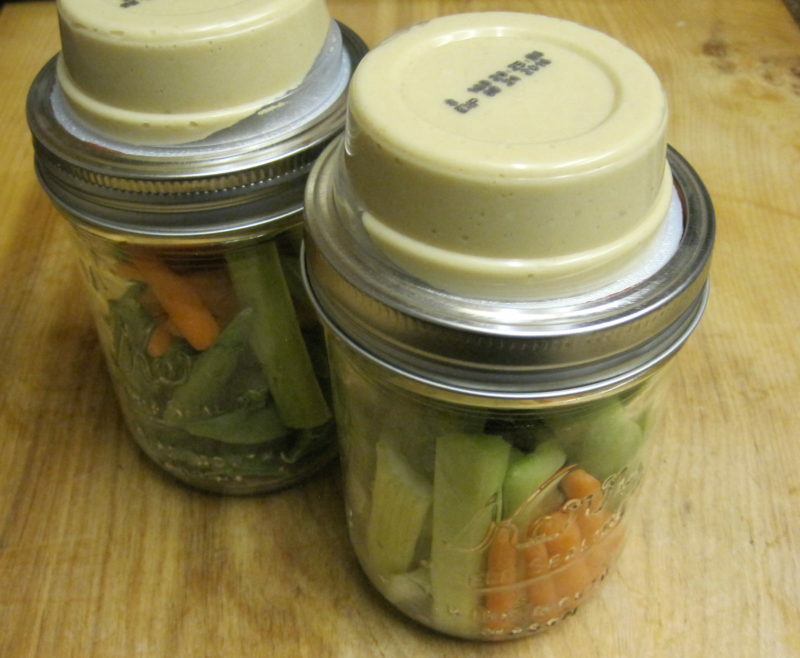 This is no big surprise to any regular visitors to my site because I love using mason jars for salads, soups, and desserts. 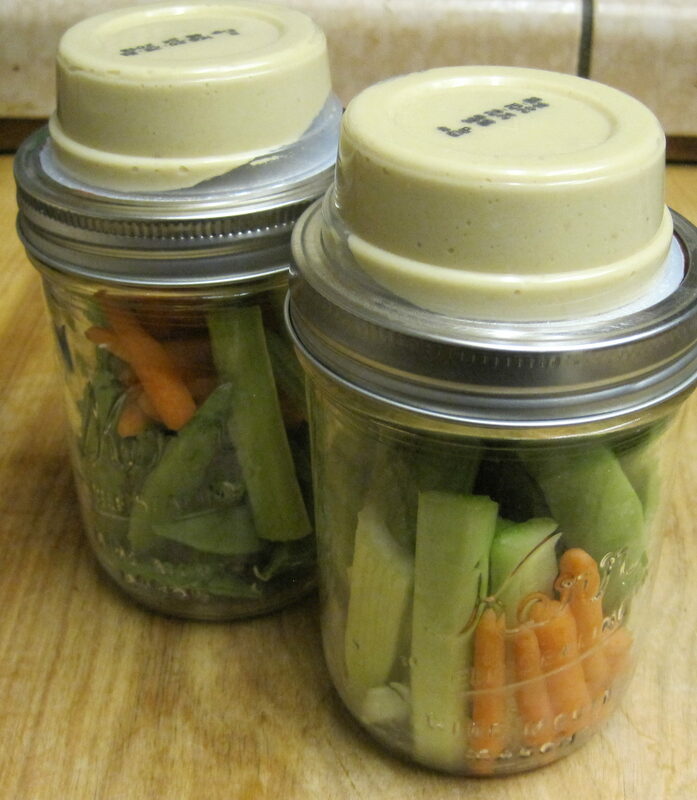 To make this, you will need a wide mouth pint jar and a 2 ounce package of hummus for each jar that you’re making. At our local warehouse store, the price is exactly the same for 16 (2 ounce) sized packages of hummus as it is for a 32 ounce container of hummus, so I bought the little grab and go ones. (I know. I can make my own hummus, and I’m making more trash by doing it this way, but the summer heat makes me lazy.). I used wide mouth pint sized mason jars which I filled with celery sticks, baby carrots, and snap peas. Some people like to include cucumber wedges, too, but they tend to weep and release liquid in the jar, so we usually leave them out. Once the jars were full of veggies, I used the ring on the lid to secure my 2 ounce package of hummus upside down on the top. These were then stored in the refrigerator for a quick grab and go meal. That’s all there is to it. It’s so easy, that I don’t really think that I need to print a recipe to go with these instructions. If you disagree, leave a comment and I will write a recipe. Nutritional information is for equal amounts of celery, carrots, and snap peas along with 2 ounces of hummus. Love that you used pre-packaged hummus in your Masonable! Could you tell me what brand? I would love to find some for my jars. Pinning to my Masonable board. Thanks so much! Denise, I used Sabra hummus 2 ounce single serving packages. I found them at our warehouse store. They’re just big enough to fit under the ring on wide mouthed jars. They won’t fit on regular sized jars. Update: I can no longer find the Sabra hummus at the warehouse store. They now stock an organic version packaged just for them. It still has good flavor, so I will switch to that one, but the cost is a little more. Denise, I really liked your idea of making your own and can’t wait to try your snickerdoodle hummus. Yum!